How Do I Fit A Ski Helmet? How Do I Fit a Ski Helmet Correctly? Before you pick which helmet to buy or rent, you should give yourself a pat on the back - all sensible skiers and boarders wear helmets. Well done! Now let's get you fitted, so that you can hit the slopes with full confidence. There is padding inside all modern helmets. This makes it fit nicely and acts as a shock absorber when you bump your head. Some brands use more padding than others, while some styles are molded differently to suit different shaped heads. It is important that you try on as many as possible, so that you get the best fit for you. 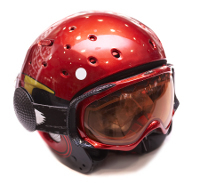 Choosing a ski helmet is a bit like picking a new pair of running shoes. It needs to be comfortable and snug. If you can swish the helmet around when you move your head from side to side or back to front, it is too big for you. Ideally, your helmet must fit your head like a protective peak hat. At the same time, your helmet can't be too tight. It will be no good to you if the helmet cuts the circulation off to your brain and causes you to pass out half way through a ski jump. The helmet needs to be clipped in properly too - make sure the strap is not dangling loosely below your chin ready to get blown off. The sun's glare can be really intense on the ice. If you plan to wear goggles or sun glasses for protection (which you should! ), try these on with your helmet before you purchase one. Your goggles need to fit with your helmet - one is no good without the other.